The virtual world is a great resource for 2nd graders, and playing science games for 2nd grade is a wonderful way to build a solid foundation in science. For more science resources, check out these fun science experiments! 2nd grade is a formative year in a student’s life. Science and math take precedence over other subjects in this grade. A few important science concepts covered in this grade are matter and its interactions, ecosystems, biological evolution, and earth’s systems. The School of Dragons game has a lot to offer the 8-9 year olds. Game quests called Bodies of Water and Shiny New Trophy introduce kids to important concepts in Physical Sciences and the Earth’s Systems. Players are instructed to visit lakes, rivers, and waterfalls and understand how all of them lead to another, example how a river runs into an ocean or a waterfall lands up in a river. Players (students) are also explained in the science quest how water can exist in both solid and liquid form (rivers and glaciers). This is a scientific quest where the students are introduced to chemical reactions. How will you explain to kids that metals melt and water evaporates when heated? Players are taken inside the virtual lab to understand that heating or cooling a substance may cause changes that can be observed. Sometimes these changes are reversible, and sometimes they are not. Learn more about the effects of heating on objects when you play the particular quest. Play more science quests such as Chocolate in a Bottle and Hiding in Plain Sight to learn more science concepts! Most 2nd graders need to work hard towards understanding and internalizing scientific concepts and for some it’s easier said than done. If your child lags behind on science, it can take him months (if not years) to catch up with his quicker peers and get the grades he deserves. And it gets worse when children enter high school and grapple with subjects such as physics, chemistry and biology. Besides, the classroom can be a stressful and competitive place for a child weak in science. 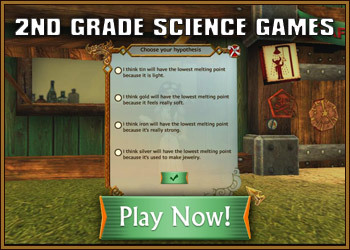 Science games online are a classic tool to help 2nd graders learn science, particularly since heavy scientific tomes don’t exactly capture a hyperactive 8 year old’s attention though it might act as a soporific. Let's find out how the School of Dragons science game can influence kids' learning in a positive way.